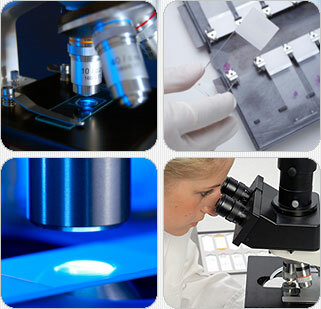 Microscope Slide Well Coatings, Silane, Poly-L-Lysine, Epoxy & more. TEKDON, INC. is a leading manufacturer of coated microscope slides including our proprietary PTFE/Teflon™ printed slides which prevent cross contamination while increasing microliter capacity. The microscope slides provide a hydrophilic well area to enhance cell attachment and spreading capabilities while the well coating retains its hydrophobic characteristics. Our microscope slides are available with epoxy, gelatin, silane and poly-l-lysine adhesive coatings and more along with a complete line of frosted end microscope slides. Tekdon offers the following slide coatings. Teflon™ is a registered trademark of E. I. du Pont de Nemours and Company.